Steel reheating is an energy intensive process requiring uniform temperature distribution within reheating furnaces. Historically, recuperators have been used to preheat combustion air, thereby conserving energy. More recent innovations include oxygen (O2) enrichment and the use of regenerative burners, which provide higher preheat air temperatures than recuperators. These processes have limitations such as equipment deterioration, decreasing energy efficiency over time, high maintenance costs, and increased NOx emissions with increased air preheat temperature, unless special equipment is used. Three things are necessary for the starting and sustenance of combustion. These are fuel, oxygen and sufficient energy for ignition. The efficiency of the combustion process is highest if fuel and oxygen can meet and react without any restrictions. But during heating practice, besides efficient combustion, transfer of heat is also of practical considerations. Normal air used for combustion contains nitrogen (N2) and argon (Ar) besides oxygen. In an air – fuel burner the burner flame contains nitrogen from the combustion air. A significant amount of the fuel energy is used to heat up this nitrogen. The hot nitrogen leaves through the stack, creating energy losses. Hence air does not provide optimum conditions for combustion as well as heat transfer. Heat absorbed by nitrogen either gets wasted or is to be recovered for the purpose of energy conservation. Present day best air- fuel heating system in the reheating furnace need at least 310 M Cal for a ton of steel for achieving the right temperature of the steel product for rolling. Historically, the primary use of oxy-fuel combustion has been in welding and cutting of metals, especially steel, since oxy-fuel allows for higher flame temperatures than can be achieved with an air-fuel flame. Introduction of an innovative oxy – fuel burner technology (using 100 % oxygen) for the steel reheating is relatively a very recent phenomenon. The concept of oxy – fuel combustion was proposed in 1982 by Abraham in the context of providing a carbon di oxide (CO2) rich flue gas. Due to the potential benefits, Argonne National Laboratory (ANL) carried out some research activities including a techno economic study and pilot scale studies on the subject. Oxy – fuel refers to the practice of totally replacing air as the source of oxidizer for combustion with industrial grade oxygen. Industrial grade oxygen is defined as liquid oxygen supply vaporized to a gas or on site generated oxygen. Liquid oxygen supply generally has a purity of over 99.99 % whereas on site generated oxygen purity is usually in the range of 90 % to 93 %. The advantage of using on site generated oxygen is lower cost as the product does not need to be liquefied or transported and is delivered at lower pressure to minimize power consumption. In integrated steel plant where there exists an air separation plant for steel making, high purity oxygen (99.99 %) can be supplied by pipeline from air separation plant. When the nitrogen gas is avoided with the use of industrial grade oxygen as in the case of oxy – fuel combustion, then not only the combustion itself is more efficient but also the heat transfer. Oxy – fuel combustion influences the combustion process in a number of ways. The first obvious result is the increase in thermal efficiency due to the reduced exhaust gas volume, a result that is fundamental and valid for all types of oxy – fuel burners. Additionally, the concentration of the highly radiating products of combustion, CO2 and H2O, is increased in the furnace atmosphere. For heating operations these two factors lead to a higher heating rate, fuel savings, lower CO2 and NOx emissions and lower SOx emissions if the fuel contains sulphur. Fig 1 shows Oxy – fuel and air – fuel combustion processes. Oxy – fuel combustion is found to differ from air combustion in many ways, including reduced flame temperature and delayed flame ignition. 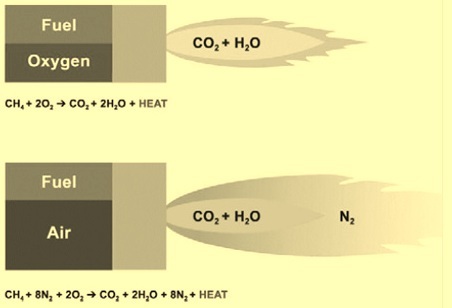 Many of the effects of oxy – fuel combustion can be explained by differences in gas properties between CO2 and N2, the main diluting gases in oxy – fuel and air respectively. CO2 has different properties from N2 which influence both heat transfer and combustion reaction kinetics. This differences are described below. Density -The molecular weight of CO2 is 44, compared to 28 for N2, thus the density of the flue gas is higher in oxy – fuel combustion. Heat capacity -The heat capacity of CO2 is higher than N2. Diffusivity – The oxygen diffusion rate in CO2 is 0.8 times that in N2. Radiative properties of the furnace gases: -Oxy – fuel combustion has higher CO2 and H2O levels, both having high emitting power. Compared to air – fuel, oxy – fuel results into a much more efficient and faster heating of the steel product. The thermal efficiency of oxy – fuel is about 80 % as compared to the efficiency of air – fuel which is around 40 % to 60 %. With oxy – fuel there is improvement in productivity and decrease in the fuel consumption to heat the steel product to the desired temperature. The use of oxy – fuel also improves temperature uniformity and produces less emissions to the environment. The general advantage of replacing air with industrial grade oxygen is that the nitrogen content brought to the combustion process with air is almost or completely eliminated. Reduction of nitrogen in combustion allows for higher flame temperature and combustion efficiency as lower combustion gas volume reduces the amount of heat taken from the flame and lost to the exhaust. During oxy – fuel combustion, a gas consisting mainly of CO2 and water is generated. Thermal transfer by oxy – fuel combustion is characterized by considerable localized transfer due to high emissivity (considerable concentrations of CO2 and H2O in the flames) and reduced flame volume leading to first an enhanced capability to transfer its energy to the load and second an extra gain in energy efficiency. For continuous heating operations it is also possible to economically operate the reheating furnace at a higher temperature at the entry side of the furnace. This further increases the possible throughput of the reheating furnace. It has been observed that the energy efficiency of oxy – fuel combustion is equivalent or even better than the reheating furnaces having equipment for highly preheated combustion air. Thus, the benefits of using oxy-fuel as compared to air – fuel combustion are as follows. Oxy-fuel results in substantial increases in available heat (total energy input minus energy lost to the exhaust) as compared to air-fuel combustion. The increase in available heat is directly related to reductions in energy consumption. An increase in available heat of combustion means that less heat is lost to the exhaust and a larger percentage of the total energy input is left to do work in the furnace. Thus, when available heat is increased the amount of total energy input required to do a constant amount of work is decreased. Increased heating rate results in higher production. The practical limit to production increase is dependent on the ability of the load to absorb heat and the time and temperature at which the load is exposed to heat. The experiences from various oxy-fuel installations is that product throughput can be increased in most operations without increasing furnace temperature set point, with the exception of those reheating furnaces which are already meeting a set temperature ramp limit. Besides the increase in available heat, the higher oxy-fuel flame temperature and radiation potential of combustion gases have a positive impact on heating capacity and production rate. As radiation heat transfer is dependent on the temperature difference from the source to the receiver to the fourth power, oxy-fuel combustion results in a large increase in flame to load radiation potential. The combustion products from oxy-fuel are also better sources of radiant heat transfer. This is because the majority of air-fuel combustion product is nitrogen which is not as an efficient radiant heat transfer mechanism as carbon dioxide and water vapour that make up the majority of oxy-fuel combustion products. Reduced furnace emissions – The volume of exhaust is substantially lower with oxy-fuel. Total exhaust volume with oxy-fuel is generally 70 % to 90 % less than total air-fuel exhaust volume. The most obvious result of using oxy-fuel is that fuel consumption is reduced. With the reduction in fuel consumption the emission of CO2 is lower over a given time or per unit of load heated. With oxy-fuel combustion the partial pressure of nitrogen in the combustion products is drastically reduced lowering the potential for NOx formation even at elevated flame temperature. In addition to the benefits mentioned above, the option of using oxy – fuel combustion can sometimes result in lower capital investment as compared to other methods of improving efficiency such as recuperators or emissions control equipment. Oxy – fuel combustion allows all installation pipes and flow trains to be compact without any need for recuperative or regenerative heat recovery units. It also drastically reduces the physical size of burners, furnaces and flue gas ducting as well as there is no need for electrical ventilation fans. Also combustion air blowers and related low frequency noise problems are avoided. Further, in some cases conversion to oxy – fuel combustion has resulted in less scale loss due to better control and shorter heating time. Oxy-fuel flames have a higher temperature with less volume and length than air-fuel flames. The flame characteristic with oxy-fuel needs to be considered when designing oxy-fuel burner systems for steel reheat applications. Generally, steel heating demands even temperature distribution so that localized over heating or under heating in the product is avoided. The type and placement of oxy-fuel burners depends on the type of furnace and the proximity of flames to steel product. While providing substantial benefits to efficiency, the low volume of combustion products with oxy-fuel require some special attention when designing combustion control systems. Proper control of combustion ratio is critical for steel heating processes as the products of combustion make up the heating atmosphere and ultimately impact the rate and type of scale formation. In air-fuel combustion systems, the high volume of nitrogen brought into the combustion process with air provides a damper or safety factor against changes in air to fuel ratio. With oxy-fuel this damper is almost completely eliminated. This means that a percent change in oxygen to fuel ratio with oxy-fuel will have a larger impact on heating furnace atmosphere than same change with air-fuel. The change in furnace atmosphere with oxy-fuel has no detrimental effect on scale formation and in some cases has proven to be a benefit. The higher partial pressure of CO2 and H2O in the products of combustion provide a more efficient heat transfer mechanism allowing for increased heating rate which reduces the time factor for scale formation. Also, comparison of air-fuel and oxy-fuel shows that the characteristics of scale formation change with oxy-fuel. The scale formed on the surface of the steel is in a thinner layer than is formed with air-fuel firing. The reason for the change in scale characteristic is thought to be because the oxy-fuel atmosphere quickly produces a thin and dense oxide layer which prevents further oxidation and scale formation. In recent years ‘flameless oxy – fuel combustion’ has been employed. The expression communicates the visual aspect of the combustion type, that is, the flame is no longer visually seen or easily detected by the human eye. Another description might be that combustion is ‘extended’ in time and space – it is spread out in large volumes, and this is why it is sometimes referred to as ‘volume combustion’. Such a flame has a uniform and lower temperature, yet containing same amount of energy. In flameless oxy – fuel combustion the flame is diluted by the hot furnace gases. This reduces the flame temperature to avoid creation of thermal NOx and to achieve more homogenous heating of the steel. In flameless oxy – fuel the mixture of fuel and oxidant reacts uniformly through flame volume, with the rate controlled by partial pressures of reactants and their temperature. The flameless oxy – fuel burners effectively disperse the combustion gases throughout the furnace, ensuring more effective and uniform heating of the material even with a limited number of burners installed – the dispersed flame still contains the same amount of energy but is spread over a greater volume. The lower flame temperature is substantially reducing the low NOx formation. Low NOx emission is also important from a global warming perspective; NO2 has a so-called global warming potential that is almost 300 times that of CO2. Also, the use of low calorific fuels is feasible, which has been emphasized lately, for example using blast furnace top gas. Oxy – fuel burners have always been powerful and compact, and the new generation of flameless oxy – fuel burners has maintained its compact design to facilitate exchange of already installed oxy – fuel burners and for easy retrofit of air – fuel installations. Furthermore, flameless oxy – fuel combustion not only adds further advantages, but opens up for new applications, all supporting a substantially decreased environmental impact. In the steel plants where oxy -fuel combustion technology has already been implemented, the following results are being obtained. There is lesser smoke emanating from the furnace stack which greatly improves the plant environment.